After listening to this band's impressive debut, Power-Drive, I eagerly inserted the promo for the band's second album into my CD player. Without even looking over the artwork, credits, or doing any sort of research whatsoever, I hit the play button and was in for a very pleasant surprise. The band has vastly improved their sound since their debut release. As I listened to this disc, it sounded to me as if the band had been listening to a lot of Iron Savior and Running Wild during the last year or so. While the debut was a hard rock album with some heavy metal moments thrown in, Battle-Tested sees the balance shift more toward a heavy metal album with some hard rock moments mixed in. First of all, let me highlight the improvements the band has made since their last effort. Almost non existent on the first album were big harmony vocals. This album has huge harmony vocals ala Iron Savior that add depth to the songs which was missing on Power-Drive. Immediately after my first listen to this album, I visited the band's website and learned that Piet Sielck has produced this album. Piet has also contributed some guitar and vocal parts which is very obvious. Furthermore, Uwe Lulis (Rebellion, ex-Grave Digger) was enlisted as engineer for the bass and drums. As you might expect, the bass lines on this album are authoritative and heavy! The rhythm section in general provides an excellent and powerful backdrop for the sound. The vocals of Guido Feldhausen have improved substantially over the first album. I thought he was a bit shaky in spots on the debut, but his voice sounds so much better on this album. He shows flashes of Rock n Rolf (Running Wild) throughout the album which is a very pleasant surprise for me. 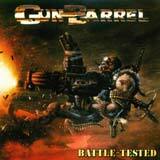 Gun Barrel made a wise choice in soliciting the help of Uwe Lulis and Piet Sielck in the making of this album. The quality of the songs has improved substantially and there is no doubt that the guys have learning quite a lot from these two men. As for the songs themselves, Gun Barrel picks up were they left off with their debut. Their sound is heavier now, incorporating more double bass into their sound. I think the beefed up bass lines are also a factor in creating a heavier sound. The addition of the harmony vocals to the song structures gives each track its own instant identity. The songs are mostly metal anthems with very addictive (but not cheesy or whiny at all) chorus lines. You're also in for a couple of nice surprises too. My Last Ale features the use of bagpipes which create the perfect atmosphere to accompany the lyrics. We Believe In Nothing features a guitar line that reminds me of the classic Running Wild album Death or Glory. Like I said earlier, the band has gone for a heavier sound with this album, but tracks such as The Raven and Save My Heart From You are simply hard rock gems. They are of the same high quality of the pounding metal anthems such as Battle-Tested, We Believe In Nothing, and Rebel Tune. The band has really nailed down a successful sound of their own incorporating some elements from power metal, classic heavy metal, and hard rock. Just about every aspect of the band's sound had improved dramatically over the debut: most notable are the song structures themselves, the lead vocals, and the rhythm section.